Craig Mackail-Smith acknowledges the Posh crowd after scoring his 100th goal for the club against Oxford. But here are some stats and some personal highlights/lowlights from the 2016-17 Posh campaign. Gwion Edwards celebrates a memorable Posh goal at Charlton. Sheffield United attracted the only gate in excess of 10,000 to the ABAX Stadium all season. 4 Not playing Cobblers a third time. 2) Leo Da Silva Lopes (v Bury, home). 3) Michael Bostwick (v Bolton, home). 4) Gwion Edwards (v Millwall, home). 5) Michael Bostwick (v Cobblers, away). 1 10 goals (Tom Nichols) is the lowest total by a Posh top scorer in a Football League matches since 2009-10 when Craig Mackail-Smith also scored 10. 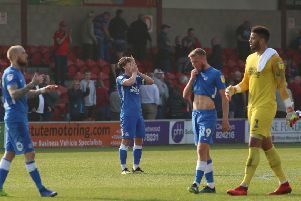 2 For the second successive season, Posh did not have an ever-present player in League One. Last ever-present was Michael Smith in 2014-15. 6 Craig Mackail-Smith scored his 100th Posh goal against Oxford on March 11, 2017, 2,112 days after scoring his 99th against Huddersfield on May 29, 2011. 1: Gwion Edwards (v C’Field, home). 2: Marcus Maddison (v Vale, away). 3: Marcus Maddison (v Charlton, home). 4: Gwion Edwards (v Charlton, away). 5: Michael Smith (v Bolton, home). 6: Chris Forrester (v Bury, home).